"I think that violence, like evil, is something innate in all of us. only the good instincts grow, not the evil ones." Who Can Kill a Child? [¿Quién puede matar a un niño?] is an odd-sounding title for a horror movie. It poses a question, but one that more readily suggests a current affairs television documentary, and it's in the present tense, like it's asking for volunteers. But this is not the only title this mysteriously sidelined but extraordinary film has appeared under over the years, having also been labeled Trapped, Lucifer's Curse, Island of the Damned and Death is Child's Play. Having now seen the film twice I can categorically state that while Who Can Kill a Child? is probably the least commercial of these titles, it's definitely the smartest. If the title suggests a documentary then the opening credits seem determined to confirm this, playing over archive footage and a sober voice-over that recalls some key moments in history when children were slaughtered en masse, including WW2 concentration camps and the Vietnam, Korean and Indo-Pakistani wars. Just how this relates to what follows is left for us to interpret, but however you read it you're unlikely to come to a comfortable conclusion. 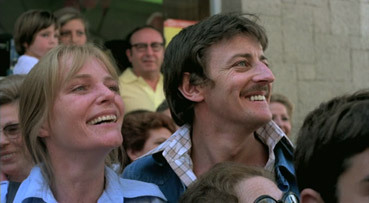 The documentary feel continues as the body of a woman is washed up on the beach of the Spanish holiday resort on Benavis, at which English holidaymakers Tom and Evelyn arrive with the intention of travelling to the offshore island of Almanzora, a place Tom last visited twelve years earlier. As the pair make their way through the bustling seaside crowds there's a vivid sense that we're watching a real couple interact with a true-life fiesta, which is doubtless exactly how director Narciso Ibáñez Serrador shot it. Aided immeasurably by the low-key naturalism of lead players Lewis Fiander and Prunella Ransome (who on the basis of their work here should have enjoyed notable movie careers instead of being confined to TV), we quickly bond with the couple, a likeable duo who appreciate their surroundings and actually make an effort to communicate in Spanish rather than talk loudly in English. Small hints of a back story regarding Evelyn's current pregnancy and Tom's initial preference for an abortion – the two kids they already have are enough, he reckons – are covered without fuss or any sense that we're being spoon-fed important exposition. All goes well until they arrive at the island, a four-hour boat trip that isolates them from the mainland, to which there is also no telephone connection. They're greeted at the dockside by a small group of fishing and swimming children, who smile at the new arrivals but have nothing to say, and when a curious Tom tries to peek in their fishing basket he's met with resistance and a hostile glare. The pair find the village completely deserted and peppered with signs that the abandonment was both sudden and recent. While Evelyn rests up in a café bar, Tom nips down the road to buy some supplies and – in a superbly executed reveal – fails to notice the dead body lying behind the counter. It's a safe bet that even if you arrive at the film unprepared then you'll have a pretty good inkling about what's going on soon after the couple arrive on Almanzora. Once again I find myself playing the how-much-to-reveal game, but this time for a film whose pre-publicity and poster artwork have made no secret of the nature of the hidden menace. If by some chance you're still in the dark and would prefer to remain so, then you might want to hop to the second-to-last paragraph of this review. For my own part I'll try to keep the spoilers to a minimum. Children are rarely portrayed as a genuine threat in cinema. This is partly because dramatic convention would require them, as the bad guys, to be physically harmed or even killed if their victims are to triumph in the final reel. And while we may be OK with adults killing adults, the killing of children in the name of entertainment – and particularly to provide the required visceral thrill that comes from seeing the hero violently turn the tables on the villain – remains one of the strongest remaining screen taboos. And to break that taboo requires a reversal of expectations regarding how young children are usually presented on screen, as creatures to be adored, protected, menaced and rescued. To show them as killers steps over an unspoken line, at least unless you've pre-empted their behaviour with demonic possession or satanic parents. And yet the presentation of children – whose perceived innocence stems in part from their undeveloped sense of what constitutes right and wrong – as the embodiment of evil is loaded with potential, as anyone who shivered through the original incarnation of Village of the Damned will doubtless recall. But in the village of Midwich there was no mistaking the evil intent of the children. With their unnaturally Arian looks, collective silence and sinister glares, these were the poster kids for stories of supernaturally malevolent minors, and even made their way onto the promotional artwork selected for this very DVD. But it's precisely because the children in Who Can Kill a Child? show no outward signs of malicious intent that they are so damned creepy. They smile, they laugh, they run and they play, and when it comes to vocal communication they are even good enough to observe the old maxim of being seen but not heard. These are the sort of wholesome, happy and energetic kids you might see a Euro-Disney commercial, but devoid of morality and lacking any empathy for the adults they gleefully dispatch. And here's where that enigmatic title comes into play. That these children are able to so easily kill adults, who by rights should be strong enough to resist such an assault, is not down to any newly acquired speed or strength, but their status as uncorrupted innocents that adults are genetically programmed to protect. To take the life of a child, particularly your own son or daughter, requires any well-balanced adult to tear down their own firmly entrenched morality, and it's not a decision to be made on instinct, giving the well armed minors all the time they need to deliver the fatal blows. * It's this inability to contemplate the morally unthinkable that drives much of the plot and provides the film with a gloriously chilling finale and an ending that borders on the apocalyptic. Who Can Kill a Child? is a far classier movie than that enjoyable but misleadingly sensationalist poster artwork suggests. 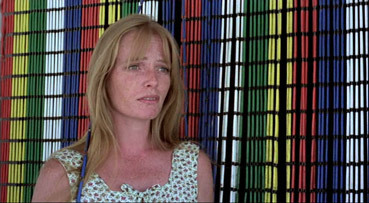 Its slow-build tension and sudden jolts show a clear influence of Hitchcock's The Birds (confirmed by cinematographer José Luis Alcaine in the interview on this disc), while its story of island visitors gradually uncovering a morally disturbing counterculture can't help but recall Robin Hardy's The Wicker Man, and I don't make either comparison lightly. It's hard to believe that writer-director Narciso Ibáñez Serrador has worked mainly in television, as this is clearly the sort of film he was born to direct, one that, had it not over the years slipped into semi-obscurity, should by rights have accrued an international reputation and a sizeable cult following. The sense that an undefined lethal threat is circling our lead characters and waiting to strike makes for unwaveringly tense and sometimes nail-biting viewing, while the contradictory nature of the playful malevolence – the old man who becomes a human piñata for giggling children armed with blade-topped sticks is a bone-chilling example – is as unsettling as anything as I've witnessed in years. Who Can Kill a Child? inverts genre traditions to compelling and still disturbing effect, in the process dragging horror out of the shadows and into the deceptively paradisical glare of the Mediterranean sun, and vividly suggesting that a capacity for evil lies dormant in us all and is just waiting for the right trigger to kick it to life. OK, this DVD has been released by Eureka so I expected a decent transfer, but I was still surprised at just how good the film looks here, particularly given its age, its previous obscurity, and the fact that this is the first UK release of the full uncut version. While not quite as pin-sharp as some transfers out there (it's still pretty damned good, and we are talking DVD rather than Blu-ray), the print itself is spotless and the pastel-biased colour palette pleasingly rendered, while the finely-balance contrast copes beautifully with the harsh glare of the sun on white stone without sacrificing any high-end detail. There is some swallowing of shadow detail in the darker interiors towards the end, but not in a way that is detrimental to the scenes in question. On the whole, a lovely job. The framing is approximately 1.80:1 and is very slightly windowboxed. The Dolby mono 2.0 soundtrack more is more representative of the film's age and low budget status, having a narrowed dynamic range and a few audible pops of damage. But these prove minor issues that do not in any way disrupt the enjoyment – dialogue and music are otherwise clear and the film's unsettling use of silence is untarnished. Director Narciso Ibáñez Serrador recalls the making of the film and reveals that it took him four days and nights to write the script, and that it was not directly based on Juan José Plans' novel but on the central concept on which that was built – the two knew each other and the script was apparently written before the novel was published. He praises cinematographer José Luis Alcaine but is split on his British actors: "I really like her," he tells us, "I didn't like him that much." He also wonders whether the documentary footage might have worked better at the film's end. 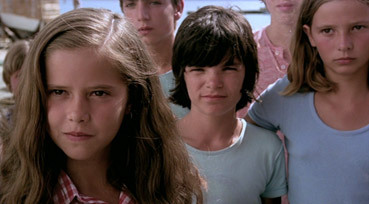 Cinematographer José Luis Alcaine recalls in some detail his how he met director Serrador – who he refers to as Chico – and some interesting specifics about the shoot, including the naturalistic approach to lighting and performance (he especially praises the children here), and how a delay in shooting prompted Serrador to pace around so intensely on the water's edge that he ended up falling in. Stay with it past the end credits, when Alcaine briefly discusses working with Pedro Almodóvar, all of whose films he has photographed since the 1988 Women on the Verge of a Nervous Breakdown. Where has this film been for the past 35 years? That it's not been more widely revered and discussed as one of the great horror movies of the 70s is not so much peculiar as downright demented. Either way, Eureka have done a real service in bringing it back into the public domain, particularly in such impressive condition. There may be only two extras, but they both provide useful information on the film's background and production, and for fans of intelligent horror and suspense films at least, this has to come highly recommended. * It's this very same moral dichotomy that made it so hard for Ambassador Thorn to turn on and execute his satanic son in The Omen, which coincidentally was released the very same year as Who Could Kill a Child?.